Rapid technological innovations and vast flows of funds are binding the globe ever closer together, and savvy insurance executives recognize that uncovering opportunities to cultivate new insurance premiums in emerging markets can represent a powerful force to accelerate revenues. Evaluating these opportunities has become more complex, however, after the sudden decline in the prices of energy and other commodities softened the market for many developing economies trying to scale globally. As a consequence, insurance executives must be nimble, regularly evaluating and refining their strategies to identify which international markets are most likely to offer the best return on investment. 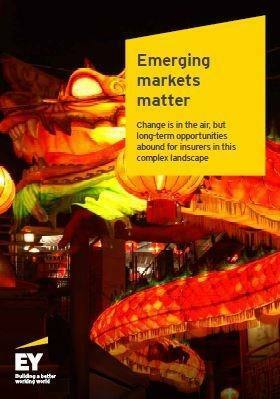 EY and Oxford Economics developed this report to highlight the potential for insurance growth in 22 countries around the globe. We have created a riskopportunity matrix to illustrate the most attractive markets for investment and those that pose the greatest risks. This sequel to Waves of change: the shifting insurance landscape in rapid growth markets, released in 2013, is designed to help executives better understand the challenges of this complex market landscape. As our findings reveal, the contribution of emerging markets to insurance premium growth will remain significant over the long term. Insurers need to identify and develop new premium revenue streams, even if some former standouts will confront significant economic challenges that may hinder growth in the near term.